Emmy 2012 Nominations: See Who Made the Cut! 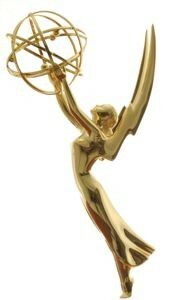 Watch the 2012 Emmy nominations online with this live streaming video. The Emmy 2012 nominees are set to be announced at 8:40 a.m.ET/5:40 a.m. PT. Kerry Washington and Jimmy Kimmel (who filled in last minute for Parks and Recreation star Nick Offerman, who was unable to attend because of travel delays) will read the nominees this year. Watch the Emmy 2012 nominations live stream and check out the full 2012 Emmys nominee list. The 2012 Emmy Awards air September 23, hosted by Jimmy Kimmel.